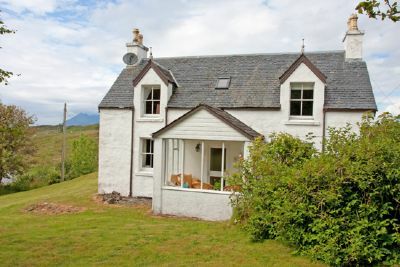 Welcome to Braeside Cottage, a traditional stone-built cottage in the tiny crofting village of Tarskavaig, nestling amidst beautiful scenery in Sleat, at the southern tip of the Isle of Skye. The cottage was fully refurbished in 2012 and is a comfortable home from home, just 30 minutes from the Skye Bridge, and 15 minutes from the CalMac ferry terminal at Armadale. Braeside sits in it’s own leafy private garden with magnificent views across to the famous Cuillin Mountains, and to the west, the Small Isles, the Minch and the Western Isles beyond. Just a few minutes away are several sandy beaches, and nearby gentle walks along the rocky shores of Sleat, long known as ‘the Garden of Skye’. South Skye has a fabulous choice of local restaurants and hotels, from the superb Hotel Eilean Iarmain at Isle Ornsay with it’s award winning Birlinn Restaurant and cosy Am Praban Bar, to the Stables Restaurant at Clan Donald Skye, at Armadale Castle and Gardens. A holiday in Skye offers so much for all the family with some amazing wildlife all year round, a great choice of boat trips often seeing seals, dolphins, whales, eagles and much more. Scotland’s famous Gaelic College, Sabhal Mor Ostaig is just a few miles away and throughout the year there is an exciting range of concerts, ceilidhs, traditional music, contemporary dance and theatre. Come and meet the locals and visitors in the Am Praban Bar where on most Fridays there is live music from local bands and musicians, giving you a real taste of life in the Highlands. Further afield Skye is justifiably famous for it’s stunning mountain scenery, rugged coastlines, sandy beaches and dramatic landscapes. Take the drive from Broadford to Elgol, some 15 miles of scenic single track road, with amazing views at every turn, and ending in the village from where a number of boat trips operate to the much-photographed Loch Coruisk, and the Small Isles of Rum, Canna, Muck and Eigg. The pretty town of Portree is the island’s ‘capital’ with it’s shops, galleries, colourful harbour, and many hotels and pubs. A few miles north is the famous Trotternish Peninsula, with it’s rugged landscapes of the Old Man of Storr, Kilt Rock and the Quiraing, often compared to the mythical lands of the ‘Lord of the Rings’ films. If it’s a gentle walk along a sandy beach, or trying your hand at sea-kayaking, or perhaps taking the kids to see the scary slimey things at the Broad Serpentarium, there is something to do for the whole family. 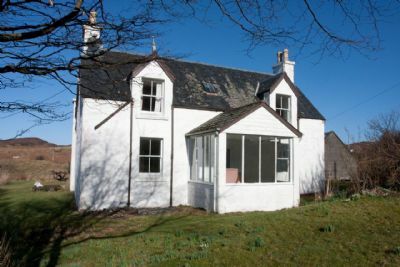 Braeside Cottage is a cosy, comfortable cottage at the heart of wonderful scenery but close by to a host of visitor attractions, fine local food and drink, and just a few hours by road from Glasgow, Edinburgh and Inverness. For peace and quiet Braeside Cottage offers the perfect holiday, but with so many things to see and do you can be assured a of wonderful time here in Skye. We look forward to welcoming you.